"Many children of the 1930's and 1940's were in awe of the 'Flying Yankee', with its green and gold locomotive, nickel-plated cylinder heads and brass name plate at its front. The nonstop express raced through Massachusetts, New Hampshire and Maine on its daily run in both directions between Boston and Portland. 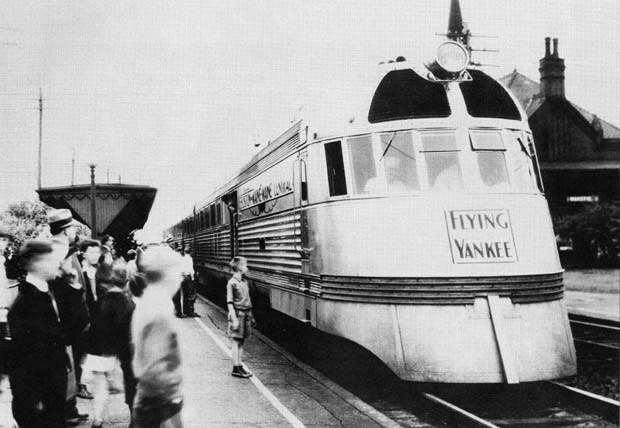 Averaging 51 miles-per-hour throughout its entire trip of 114.6 miles, the Flying Yankee began its test runs in April, 1929, roaring through Wakefield on its way to Boston at 8:14 p.m. and making its northbound appearance at 9:45 a.m. The entire trip, between Boston and Portland, took two hours and 15 minutes. The upper part of its great boiler jacket, 'surmounted by the steel dome and sand dome, steel turrets, and the locomotive bell' was painted green to match the grass on New England hills. Below that, the running gear was a darker green, matching the color of New England pines. Both were striped with gold. A stripe of gold matched the running board and ran the entire length of the engine, and the tender, painted the darker green, bore the name of the Boston & Maine railroad insignia in gold. Below the cab, also in gold was the 'Flying Yankee'." -- Text from calendar by Jayne M. D'Onofrio. “Flying Yankee, Boston to Maine,” NOBLE Digital Heritage, accessed April 22, 2019, https://digitalheritage.noblenet.org/noble/items/show/6947.